What to read First! Where should you start? There are three series to consider. All are set in the same universe. I began telling Stiger and Eli’s story in the middle years…starting with Stiger’s Tigers, published in 2015. Stiger’s Tigers is a great place to start reading. It was the first work I published and is a grand fantasy epic. However, if you desire, you can easily start with Stiger, Tales of the Seventh, which covers Stiger’s early years. 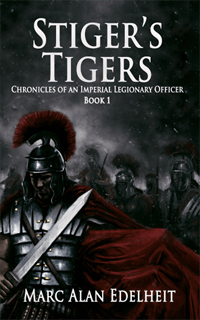 It begins with Stiger’s first military appointment as a wet-behind-the-ears lieutenant serving in Seventh Company during the very beginning of the war against the Rivan on the frontier. This series will see Stiger cut his teeth and develop into the hard charging leader that fans have grown to love. It will also introduce Eli and cover some of their early adventures. These tales should in no way spoil your experience with Stiger’s Tigers. In fact, I believe they will only enhance it. The Karus Saga is a whole new adventure set in the same universe…many years before Stiger was even born. 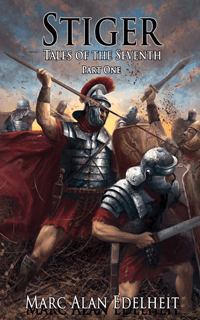 This series tells how Roman legions made their way to the world of Istros and the founding of the empire. 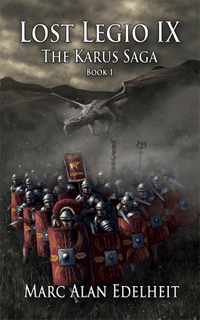 It is set amidst a war of the gods and is full of action, intrigue, adventure, and mystery. A nobleman from an infamous family, Ben Stiger, finds himself freshly assigned to Third Legion, Seventh Company as a lowly lieutenant in the opening stages of war between the empire and the Kingdom of the Rivan. Third Legion has been tasked with pursuing a retreating Rivan army back to the border where the empire can take the fight into enemy territory. However, a major obstacle stands in Third Legion’s path: the river Hana. The crossing is sure to be contested and dangerous. Should Third Legion fail to force a crossing, the entire campaign could grind to a disastrous halt. This is Stiger’s first military appointment. Inexperienced, young, and unsure of himself, Stiger is ostracized by his fellow lieutenants. Worse, he’s been placed under the command of an incompetent officer. With life and reputation on the line, he must learn to understand men far beneath his station and lead them into battle. Stiger struggles not only against the enemy, but against his family's history and his own side to prove himself worthy of serving the empire he loves and earning the respect of the men he leads. A nobleman from an infamous family, imperial legionary officer, and a born fighter…Captain Ben Stiger finds himself reassigned from a crack legion to the rebellion simmering in the South. Placed in command of a truly terrible company, the 85th Imperial Foot, he is unknowingly sent on a suicide mission to resupply an isolated outpost, the garrison of Vrell. Along the way he must rebuild his new company, gain the respect of the men he leads, survive an assassination attempt, and fight bandits, rebels, and an agent of an evil god. His companions on this journey of discovery and adventure are one of the few remaining elven rangers and a paladin on a quest for the High Father. A young woman is discovered in a dungeon, where she has been abandoned and left to starve. Inextricably linked with Karus’s own destiny, she may be the key to salvation, or worse, the instrument of destruction for the Ninth. Cast adrift in a terrible war, Karus must find his way through the mysteries of this unfamiliar world, one that is filled with true magic, strange alien races, evil gods, and dragons. More importantly, Karus must discover his destiny and complete a desperate task set for him by a god of Rome. Should he fail, it will mean certain destruction for the Ninth, the triumph of evil, and the rise of a new order.